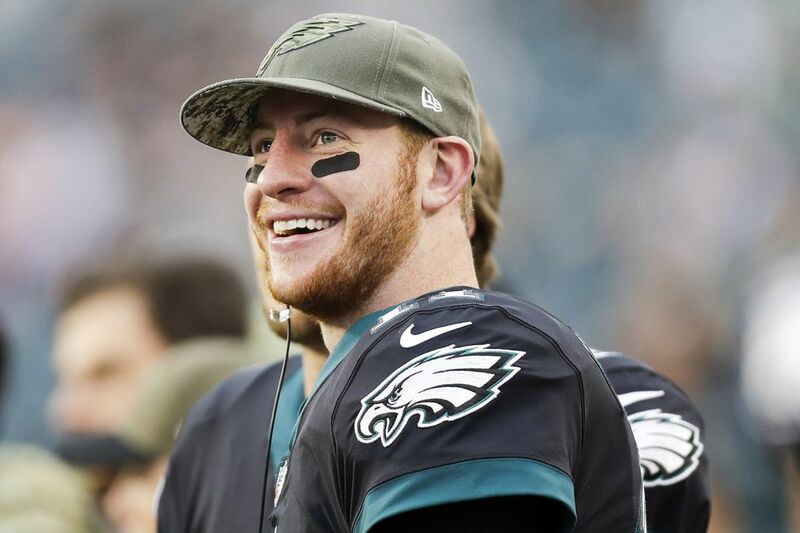 Eagles quarterback Carson Wentz smiles while on the sidelines during Sunday’s win over the Broncos. The folks at ESPN ranked the Eagles as the 22nd-best team in the league after the NFL draft in April. After the additions of Alshon Jeffery, Torrey Smith and LeGarrette Blount, ESPN moved the Eagles up seven slots, ranking them 15th entering the preseason (and four spots behind the now-lifeless Giants). Now, according to their Football Power Index (FPI), not only are the Eagles the best team in the league, but they're also the favorite after eight weeks to win the Super Bowl. ESPN analyst Ryan Clark predicts it will be an all-Pennsylvania Super Bowl, featuring the Eagles vs. the Pittsburgh Steelers (though the former Steelers safety always tends to pick Pittsburgh, so take it with a grain of salt). Even the Washington Post, the only outlet last week to keep the Eagles out of the top spot (mostly because of the injury to Pro Bowl offensive lineman Jason Peters), proclaimed the team "the league's no-doubt-about-it powerhouse" after Sunday's 51-23 demolishing of the Denver Broncos. Another noticeable trend has been the steady climb being made by the Cowboys (reaching as high as #4 in NFL power rankings), who will host the Eagles in two weeks on Sunday Night Football. The Cowboys have entered the second half of the season with a three-game winning streak, including an impressive victory over the Kansas City Chiefs that led five-time Pro Bowl linebacker Tamba Hali to tell Dallas Morning News reporter Jori Epstein that Dallas is "the best team in the league." The Cowboys will face the Falcons this week while the Eagles enjoy the bye week. And there's still the unsettled matter of Ezekiel Elliott's potential suspension. But if Dallas is able to come out of Atlanta with a win and a 6-3 record, it'll make their Nov. 19 matchup against the Eagles all that more interesting. "Carson Wentz leads the NFL in touchdown passes (23) and is the primary reason the Eagles jumped from 15th heading into the season to first in our midseason edition. Thanks to the great start, Philadelphia is the [Football Power Index] favorite to win the Super Bowl (20.8 percent chance)." "The Eagles stay perched in the top spot, Eagle-y. Thought at the beginning of the season that Philly had a real chance to be one of the wild-card teams, if not challenge for the NFC East title. Now fans are thinking home-field — and why shouldn't they? Carson Wentz is a legit MVP candidate. The Eagles are playing solid ball on offense, defense and even made some hay on special teams Sunday. Perhaps most importantly, Philadelphia did what good teams are supposed to do against weak opponents, especially at home: win decisively. How many of the supposed contenders haven't done that this season? The Eagles are a top-flight team … THE top-flight team." "There is no reason to doubt any longer that this is the NFL's best team. It's not an early-season illusion. It's past the halfway point of their season, and the Eagles are the league's most complete team. The offense hasn't missed a step since losing left tackle Jason Peters. Newly added RB Jay Ajayi made an immediate contribution Sunday. The progress made by QB Carson Wentz and Coach Doug Pederson in their second year together is the key to all of this." "Scoring 51 against the defense that won Super Bowl 50 may be the clearest sign yet that this team is headed for Super Bowl LII." "If the Patriots are the best team in the AFC, the Philadelphia Eagles are the best team in the NFL. Adding running back Jay Ajayi to help balance out the offense puts an already elite team over the top. What's elite about Philadelphia? Well, quarterback Carson Wentz for one. His play in year two has been incredible. He can attack downfield, buy time in the pocket, make plays with his legs and create offense on his own. There isn't anything he cannot do, and when the Eagles need to rely on him, he delivers." "They put up 51 points without Zach Ertz, who has been their most reliable receiver. Against a Broncos defense that is still among the best in the NFL. They're deep on offense, especially with Alshon Jeffery heating up and Jay Ajayi in the mix. The Eagles have a bye week and then a fun Sunday night matchup at Dallas on Nov. 19. Win that and they're running downhill to a division title." "Today's first history lesson – the previous four times Philly started a season 8-1, they advanced to the NFL title game / Super Bowl." "Wentz, Brady. Brady, Wentz. Can't go wrong either way. The Eagles have the best record in football, and Wentz has had dominating games against one excellent defense (Denver's, on Sunday) and a good one, Washington's. Wentz led Philly to 85 against Denver and Washington in the past three weeks. He has the NFL lead in touchdown passes (23), and he's second in yards and third in rating. Perfect example of his impact: Against Denver, he rolled right and, with Von Miller in his face, threw 32 yards down the right sideline perfectly for Alshon Jeffery for a touchdown—with Pro Bowl cornerback Aqib Talib in tight coverage. Wentz has been making these types of plays all season."